Looking "where to sell my Mercedes Benz 220SE?" Ask the Chicago Car Club! Are you wondering "where to sell my Mercedes Benz 220SE ?" The Chicago Car Club is interested in classic cars of all makes and models, especially a Mercedes Benz 220SE. We make the process of selling your Mercedes Benz 220SE quick and painless. In just a matter of hours we will have your classic valued and, if you do so choose, turned into money in your pocket. All it takes is a phone call or electronic inquiry to get the ball rolling. In 1958, Mercedes-Benz marked its 75th anniversary with the opening of the Daimler-Benz Museum in Stuttgart, Germany. It also used the opening to debut the 220 SE. The car contained updated features from the 220 S; the new additional features included mechanical fuel injections that enhanced the bhp to 137. 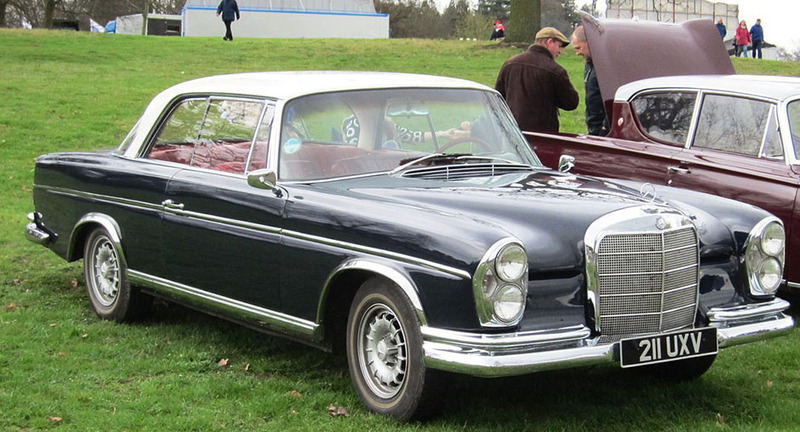 Mercedes Benz produced the 220 SE from 1959 to 1965. It was available in three different body styles: the sedan, coupe, and cabriolet. There were 66,086 sedan units, 14,173 coupe units, and 2,729 cabriolet units produced. The 200 SE used a 2.2 liter 6-cylinder engine for its unitized body and frame, with a fully impending suspension. It had an aluminum head, overhead, camshaft, and Bosch mechanical fuel injections. The 1962 220 SE featured crumple zones and had a newly structured passenger section; the car stretched 191.9 inches on a 108.3 inch wheelbase. The 220 SE earned the nicknamed ‘fintail’ due to the slight changes to the body, which included a fintail, to make it more attractive to American buyers. The 1964 220 SE was considered one of the most advance sedan cars in the world at the time. Its maximum speed could reach 100 mph.